Set of 3 x 1/2 oz 2015 Australian Outback Coloured Silver Proof Coins | ?? 3 x 1/2盎司2015年澳洲内陆彩色精制银币系列 The Australian Outback coloured silver coin collection celebrates the Perth Mint's popular bullion coins in full colour with half ounce sizing. The kangaroo coin captures the design of the 2015 bullion Kangaroo coins, with a kangaroo hopping across the outback at dusk and the moon in the background. 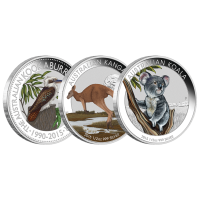 The koala coin mimics the 2015 Koala coins, with an adult koala sitting in a eucalyptus tree in a rural setting. The Kookaburra coin features the same design as found on the 2015 25th anniversary Kookaburra coins. The kookaburra is surrounded by eucalyptus and fern leaves. 2015 was the last year the Outback collection was issued. With no more than 2000 sets being issued, these will always be in demand by fans of the land down under.